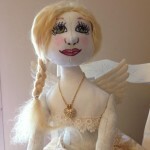 I have always enjoyed creating art forms, from working in clay and designing my own pottery and wall art, to making and decorating cakes and cake toppers and then to quilting.Selecting colors that coordinate into a beautiful quilted wallhanging or bed quilt has been my passion. 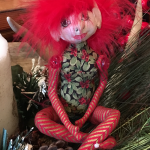 While on vacation with my husband a few years ago, my love of fabric and color led me to a quilt shop in Bolder City, NV where I encountered the whimsical art dolls of Teresa Cato. 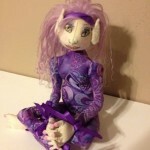 This was a turning point in my artistic life and sent my imagination to creating my own faery tale dolls. 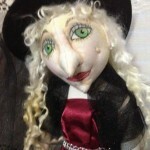 My art dolls are primarily made of cloth utilizing the same beautiful fabrics I find in the quilt shops I love to haunt. 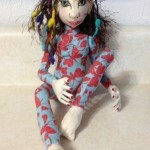 My doll hair is fashioned from Tibetan lambs wool to simple knitting yarn and everything in between. I have even been known to use an onion bag for hair in a pinch! 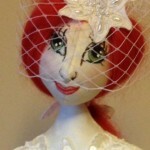 My faces are needle sculpted and painted with water color pencils and pens. Clothing is embellished with anything that attracts my attention. 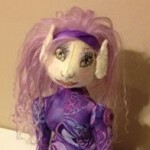 My ‘hobby’ art quickly became much more when family and friends began requesting my dolls and then ordering them for others. 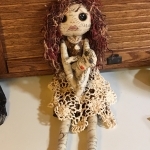 Some of my dolls were displayed this year at the MO State Fair where I was delighted to win an art award as well as several first place ribbons. 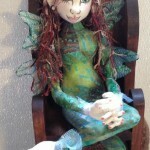 This exhibit also led to requisitioning of my dolls by a local merchant for their retail store. Who knew that something that brings so much joy to me would bring that same joy to others.